Do You Want Real-Life News Injected Into Your Computer Games? Seen it in the news? Now play it: a mobile-game programming system allows 3D depictions of news events to be introduced into the action. It's been developed by MultiPlay.io, a British start-up that says the technology could make gameplay more current and provide new ways for designers and coders to make cash - perhaps selling "news injection" rights to news agencies, TV stations or newspapers. The firm's HTML5 games creator, also called MultiPlay.io, lets users import 3D animations during gameplay, allowing, for instance, last week's meteor explosion over Russia to be pasted in above the game action, says one of the company's founders, Ashraf Samy Hegab. Similarly, he says, if a millionaire footballer hits the news in, say, a fight with a nightclub bouncer, lookalike avatars could engage in just such a fracas as you motor by in a driving game. The system creates games for Apple iOS, Google Android and Windows Phone devices. Changes to games need to be made in a browser on a PC or Mac, but can be made in real time without you having to download an app update. "We're using a clever way of splitting the game logic that lets you change the game on the fly, as easy as a drag-and-drop task in a browser," says Hegab. "You don't need to know anything about servers or 3D programming using our engine." 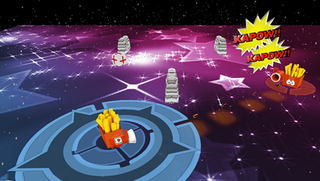 The idea also lets you extend the game's virtual playing area by expanding the game map, or add 3D vehicles you've designed yourself, such as glitzy spacecraft or cars. You could even add a model of yourself. But news injection is MultiPlay.io's main aim - and its founders are hoping to interest news agencies when Mobile World Congress kicks off in Barcelona, Spain, later this month. They are not alone: adding news to make games more relevant is becoming popular, with some websites beginning to offer games with news-related activities built in, such as the fascinating Game The News, which "creates its own twists on news events in a playable form".